Since the 1950s, we have known that the widespread use of antibiotics in animal production leads to the development of resistant strains of bacteria that threaten human health. Similarly, the general public got to know about the ability of hormones to cause cancer after the effects of diethylstilbestrol were detected in the 1970s. Dr. Chopra has spent the past four years writing a meticulous narrative of events during his 35-year career, constructed from memos, minutes and transcripts of court and Senate proceedings. With an insider’s knowledge that can only come from being a participant observer, Dr. Chopra describes the chronic tensions between management and the food safety evaluators who work for the Canadian federal government. The Federal Minister of Health is charged with upholding the Food and Drug Act and its regulations and Dr. Chopra and his colleagues advised not only that proposed new hormones and antibiotics should not be approved, but that the approvals of the existing uses should be cancelled. Dr. Chopra’s condemnation of modern food production practices goes much further than hormones and antibiotics, and includes the feeding of slaughterhouse waste to other animals, the development of genetically modified organisms (GMOs) and the uses of pesticides. Dr. Chopra was born in 1934 in an India that was progressively being influenced by the politics and ethics of Mahatma Gandhi. He started working for the former Department of National Health and Welfare in 1969. In this sense he is a talisman of a bygone era of public service that had ethics – largely suspended since that time – and also a touchstone of cultural beliefs against which to reflect contemporary Canadian society that is based on a philosophy of rational action and short-term self interest. Sometimes epithets can provide deep insights into cultural fault lines, and with the assessment that Dr. Chopra was unfriendly towards “The North American way of doing business”, management simultaneously provided a name for Dr. Chopra’s perceived deficiencies and for its own corruption. For polite Canadians, there will be discomfort about Dr. Chopra’s use of the word “corruption” in relation to the federal government. Dr. Chopra’s career spanned tectonic changes in our social, economic and political outlooks. In our competitive, post-modern and relativistic world, we are forced to ask whether the role of national governments should not be to provide a milieu for economic interests. Despite the thalidomide tragedy of the early 1960s, the department that Dr. Chopra joined in 1969 had already been corporatized, particularly to meet the interests of the pharmaceutical industry. However, it was in the Mulroney neo-liberal era of deregulation that the self-styled “nuts” in several transnational pharmaceutical industries persuaded their managements that overseas markets could be penetrated by using Canada as a “stepping stone” and the pharmaceutical lobby in Ottawa subsequently expanded its power and influence. Within Health Canada, the new breed of manager was expected to “reengineer” the organization so that the “client” was no longer the public that Dr. Chopra was sworn to protect, but the pharmaceutical industry. The guardians had become traders. One is left to wonder what psychological profile was needed for these new Health Canada managers to be able to serve successfully in an administrative environment requiring such moral detachment. Click here to order this important book! Dr. Chopra does not explain the currency of the “North American way of doing business” but, in the narrative, there seem to be two implicit characteristics. Flexibility seems to be the first characteristic of the successful Health Canada trader and Dr. Chopra describes the procession of senior managers, many without the requisite technical qualifications, who make creative reinterpretations of rules and principles in making executive decisions about approvals and regulations of products. Risk-taking seems to be the second characteristic and the high rate of turnover of senior managers ensures that the decisions made in imposing new risks on the public and on nature seldom stick to those who made them. Dr. Chopra describes how the North American way of doing business requires that risk management take precedence over risk assessment and risk avoidance. It now seems that all technologies and innovations are permissible, they just have to be managed correctly to make a profit and to avoid liability. Since the Mulroney era, the federal government seems to have lost the legal concept that some technologies are so dangerous to society and to nature that all human activities involving them should be absolutely prohibited using the Criminal Law Power, to protect human health and the environment. As Dr. Chopra points out, there are several drawbacks to these arrangements. First, there is the problem of trust. If Health Canada officials have systematically colluded with corporations in making extra-parliamentary decisions involving the imposition of new risks on society, they have been undermining their responsibilities to protect human health in the interests of capital making profits. While these officials permit and approve the new technologies on behalf of industry, they have little control over their use, and the governments, rather than the industry, are held liable for any damage. Little by little, distrust of governments grows among the electorate; this is reflected in low voter turnout and in increased questioning of the legitimacy and value of governments. The second drawback is that the past century taught that many new technologies from science involve not so much risks as actual injuries. However, with the “downsizing” of governments and the general antagonism towards epidemiological surveillance of effects, widespread subtle injuries can remain undetected in the population and in the food sources for decades causing havoc to health and the national economy. Corporatist arrangements by which the government aligns itself with industrial production can lead to right-wing excesses of control and repression. In Canada, we are fortunate to have immigrants like Dr. Chopra who can bring alternative frames of reference to our governance. Most of us are culturally conditioned to fit in as team players and even if we do perceive the systemic administrative irregularities, do not have the fortitude to battle for decades against them. In this, Dr. Chopra was fortunate to have the active backing of his union, The Professional Institute of the Public Service, which underwrote the costs of his numerous harassment and grievance proceedings and his court battles. The book was published prior to the predictable economic meltdown and is very timely as we enter a policy vacuum that may portend the end of Brian Mulroney’s neo-liberal experiment. The question is whether Health Canada and other departments of the Canadian government can strike a new balance between the generation of wealth by corporate interests and protection of society and nature. In this sense, the camera that took the front cover picture of Parliament may have been pointed 180o in the wrong direction. Behind the photographer was the Langevin Building containing the Prime Minister’s Office and the Privy Council Office. It is in those offices that the general tone and style of government administration are formed and systemically diffused to the departments. Within the context of our parliamentary democracy, will corporate lobbyists continue to exert their gargantuan power to disproportionately influence future Canadian governments through unfettered access to the Langevin Building? 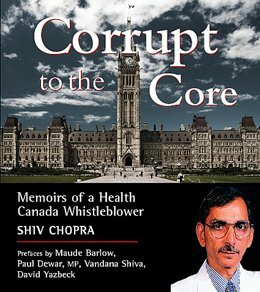 If the elites within Canadian society read Dr. Shiv Chopra’s book, they may begin to understand the enormous dangers, not only to Canadian society, but also to themselves, posed by corporatism in the regulation of pharmaceutical and other products of modernity and the role the elites need to play in countering these injurious excesses.